Sharing Space was a CRC newsletter that previously came out three times a year. The main goal was to give new ideas for facilitators and also to share information about various CRC programs. Contributing writers and CRC staff contributed articles about other materials to Sharing Space that reflected CRC’s mission and vision for a more peaceful and just world. Now, Sharing Space has become a blog where we can “share” articles, materials and event happenings, just as we did in the old Sharing Space newsletter. This blog will be the new place to share new information as well as post some of the old Sharing Spaces that were printed over several years. We welcome your comments. We also welcome articles and ideas on how you have used CRC’s ideas and materials; please send to inquiries@crc-global.org. 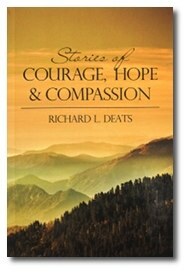 Stories of Courage, Hope and Compassion is an easy flowing little book full of insights and wisdoms from everyday heroes. Their stories will inspire readers to find the positive side to life’s most challenging lessons. Richard Deats first writes about Della Stauber of Bozeman, Montana. Stauber, inspired by Dr. Martin Luther King would type out inspiring little messages on paper, carry them everywhere she went and then hand them out to people she talked to. The little messages were messages of hope in the face of King’s proclaimed three evils: poverty, racism and war. There is a quote found in the chapter – Visiting the Land Of The Enemy that sums up the meaning behind the stories found in this little book. “ You don’t make peace with your friends. You make peace with your enemies.” This was Yirzhak Rabin’s response to criticism whenever he would meet with Palestinians. The stories in this book exemplify Rabin’s sentiment and the unlikely heroes in this book act on his very words: the Daffodils For Peace in the wake September 11; anti-apartheid Rommel Robert’s growing friendship with his jailer in South Africa; one woman’s work to transform an American president’s Cold War view on Russia; Margaret Cornelia Morgan Lawrence’s unwavering strength and faith in the face of racism and sexism and the Weisser’s love and compassion for KKK leader Larry Trapp. Richard Deats is a firm believer in the power of humor and incorporates the use of it in many of his writings. In the chapter The Power of Humor, there are many examples of how bringing humor and laughter to an unpleasant or negative situation can bring light to that situation to make it more hopeful. A brighter outlook can make problems feel less like a lost cause. When one reads Stories of Courage, Hope and Compassion, Mahatma Gandhi’s often spoken words come to mind – “the impossible…ever becoming the possible.” Every chapter in this book is a little life lesson how never to believe good is impossible; it can triumph over all, including evil.